(CNN) -- Renault face an extraordinary meeting of the FIA World Motor Sport Council in Paris later this month to answer charges of potential race-fixing. 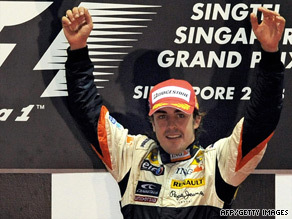 Fernando Alonso celebrates his disputed victory in last September's Singapore F1 Grand Prix. The allegation surrounds last season's Singapore Formula One Grand Prix when Fernando Alonso won the race, aided by a crash from then team-mate Nelson Piquet Jnr. If found guilty, the team face severe sanctions which could result in them being excluded from the current world championship. A statement from the FIA read: "Representatives of ING Renault F1 have been requested to appear before an extraordinary meeting of the FIA World Motor Sport Council in Paris on Monday, 21 September, 2009. "The team representatives have been called to answer charges, including a breach of Article 151c of the International Sporting Code, that the team conspired with its driver, Nelson Piquet Jr, to cause a deliberate crash at the 2008 Singapore Grand Prix with the aim of causing the deployment of the safety car to the advantage of its other driver, Fernando Alonso." Initially, Alonso appeared somewhat fortuitous in taking the chequered flag as the double world champion had started from 15th on the grid. Intriguingly, Renault had opted to fuel Alonso short for his first stint, a bizarre tactic when starting so far down and on a typical street track where it is notoriously difficult to pass. Renault gambled on there being a safety car incident, and just two laps after Alonso made his first pit stop on lap 12, Piquet's crash turned the race on its head. The Brazilian's moment into a wall also took place on a part of the circuit where there was no crane to hand, otherwise the field might slowly have filed past under waved yellow flags whilst it was recovered. But with the crane on track, it necessitated the safety car, resulting in the pitlane being immediately closed. When it eventually re-opened, virtually the entire field dived into the pits, culminating in Alonso emerging in fifth place. Of those ahead of him, Jarno Trulli and Giancarlo Fisichella pitted later, whilst Nico Rosberg and Robert Kubica were penalized as they had been forced to stop when the pitlane was closed. Alonso then inherited a lead on lap 34 he cemented with victory, Renault's first for two years, and at a time when it was strongly rumored they were considering quitting the sport. At the time suspicions were roused, in particular by Felipe Massa who is understood to have confronted Renault team principal Flavio Briatore, accusing him of engineering the crash. Massa started from pole and was leading when the accident took place, with his first stop then wrecked when he pulled away too early, leaving the fuel hose attached to his Ferrari. Piquet explained the incident away at the time that he was trying too hard, made a mistake and scraped one wall a little too closely. Only recently Piquet was sacked by the team, with the suggestion it is the 24-year-old, or his father and manager Nelson Piquet snr, who has since blown the whistle, prompting an investigation, and now subsequent hearing. Formula One supremo Bernie Ecclestone this week warned "there is going to be a lot of trouble" if the allegations are found to be true. The FIA proved with the spygate saga only circumstantial evidence is required for them to impose strict penalties. On that occasion they fined McLaren $80 million for breaching the same article that is now now faced by Renault.